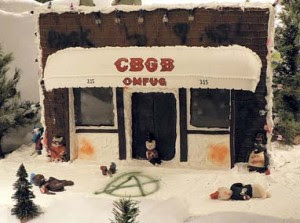 Now that the birthplace of punk has been converted into a designer boutique, this gingerbread house takes the idea of consuming pre-gentrification New York City to its ultimate, yuletide conclusion. 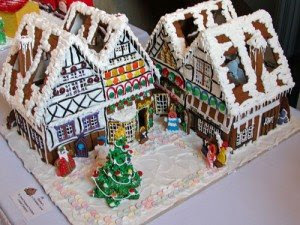 From pop music gingerbread references to the canon of British literature in gingerbread form, Listicles has all your high-low gingerbread needs covered. Although, this scene looks a little too colorful and cheerful for Dickens’s vision of working class toil. It’s also much too big: food was scarce back then. Well, talk about making it extra hard for yourself and knocking out any competition in the process. 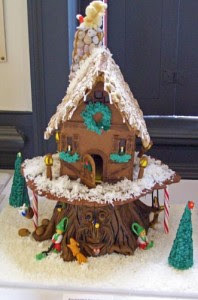 Not only does this circular model look minutely crafted and inventive, its rounded shell also seems more appetizing than the usual rectilinear gingerbread slabs they use in construction these days. As we head into Cold War 2 (along with Gulf War 2, you’d think America was stuck on sequels! 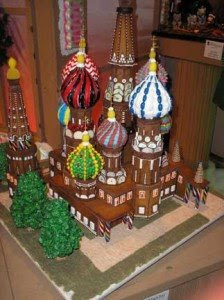 ), nothing will give bombshelter-dwelling Americans more cathartic satisfaction at Christmas time than eating the Kremlin. Take that Commies! 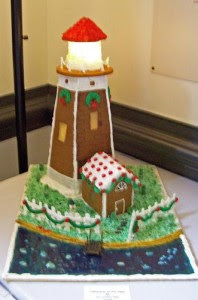 Let’s just hope they don’t get their hands on our Gingerbread Pentagon. Now for some vintage Americana, this one goes out to all the Jeffersonians out there. Nothing says “I love my country” like ingesting a symbol of American democracy and architectural style. 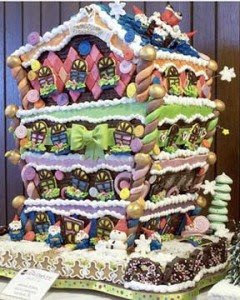 This seems like a fitting tribute for a children’s book-writer whose drawings often already resembled gingerbread constructions. That said, I don’t think the Lorax would be too happy about all the Truffula trees that had to be cut down to make way for this luxury condo gingerdevelopment. 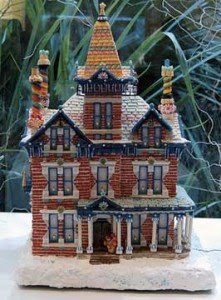 Another children’s story reference, this one meticulously completed with string candy for shoelaces and Santa’s legs sticking out of the chimney (or should I say… “chimknee”?). 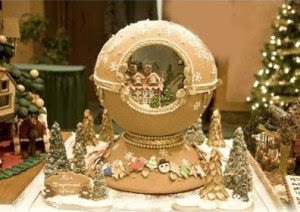 If you can’t live in the house of your childhood fantasies, maybe the best you can do is eat it. Again though, this one looks like an old growth tree was chopped down to use its stump as foundations. I bet the Lorax will come knocking on their door soon. 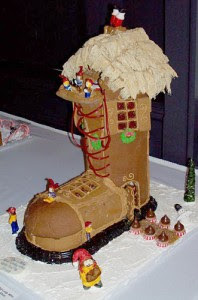 Not unlike the real construction industry, gingerbread construction is prone to the occasional revolutionary engineering breakthrough. 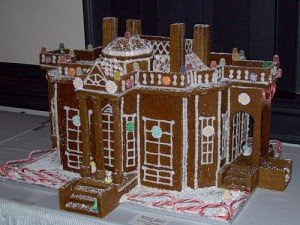 One that occurred recently is the incorporation of Twizzlers into the typical set of gingerbread construction materials for binding, color and ornamentation. 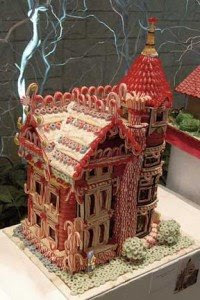 Though the above house is a rarity now, gingerbread construction predictions estimate that by 2015 up to 40% of worldwide gingerbread house construction will involve the use of structural Twizzlers. 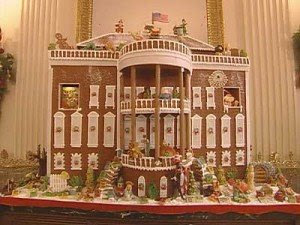 Beyond the contradiction in terms (gingerbread is brown, the White House is white), this is the last holiday season to enjoy the symbolic pleasure of eating the Bush White House (somehow that sounds dirtier than it is). Perhaps it even merits an especially vicious destruction to get all the bad voodoo out before the Obamas move in, like so..